Rockin’ some pink… also, jelly shoes (not shown). When I was little, I LOVED pink… like in the Pee Wee Herman “Why don’t you marry it” kind of way. 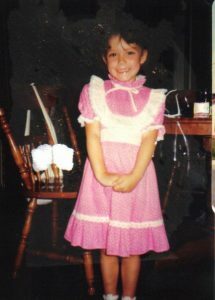 I had pink clothes, pink purses, pink ponies, pink Popples (hey, it was the 80’s! )… I was the ultimate girly girl, in almost every sense of the word. The thing I wanted most in the whole entire world though, was a pink bedroom. Sadly, while pregnant, my mom (who was only trying to do best by her firstborn) read an article about how a pink bedroom would make me dumb, and how yellow would raise my intelligence. That’s an ice, ice, baby shirt… and a fanny pack. 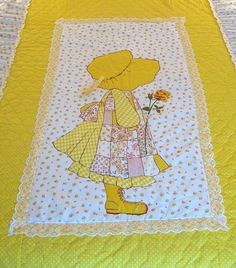 But I didn’t care.My childhood bedroom was decked out in a yellow Holly Hobbie bedroom set. I’m sure it was fine, but my little heart yearned for pinker pastures. When my parents separated, my dad used the allure of a pink bedroom to get me to move in with him… the only downside was that he secretly believed my mom was right (and wanted an intelligent daughter), so he found a pink so light that the only way to discern it from white was to compare it to the door frame and base boards. I finally had my pink. 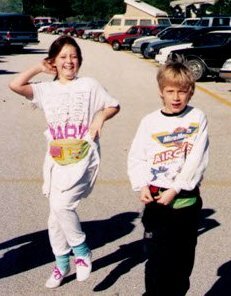 As I moved into my teens, I began to reject the idea of pink. I wasn’t just angry and angsty (though I was), I became hard. I had a lot of fear and instead of finding a healthy outlet, I closed off, tried to act tough, rough housed, became one of the guys. These things are all fine if that’s who you really are, but it wasn’t me… it was this self-preservation device I’d installed to keep myself safe. I wore a lot of black (yes, there was even a goth phase), and I started to close off to my femininity. I thought to be feminine meant to be weak, to need to be rescued. (That may be the princess programming I received from Disney.) In many ways, I think pink became a casualty of that thinking. But whoever said that feminine meant weak, anyways? Why not be a distress-less damsel? I held onto this hardness, this tough exterior (which if I’m honest, pushed a lot of people away) well into my 20’s, and whenever I had any little tickles for the colour pink, I only allowed myself to explore hot pink (usually with black), especially during my semi-punk phase. I hid my chick-lit novels with their bubblegum covers in the closet and under the bed, full of shame like I was a teen boy caught with his first nudie mag. 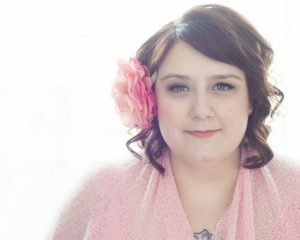 As I got into my late 20’s, I started my personal development work, which is when I became able to soften, to realize my femininity and to reconnect with my inner girly girl. Me today (2015) – Pinkified and fancy-free! End note: this pink thing is just me and my experience… I mean no harm with generalizations and make no assumptions. I can only speak for me and how I see and feel. This is my journey in, out and back into pink-land and not a critique of society as a whole with regards to pink, gender stereotypes, or any other heavy stuff that goes along with it.So why now? Why the rant about pink? I’m on the brink of my mid-30s, and am designing my new office at Pampered Goddess HQ. The last office was shared with our kitchen, and now I have a separate room, and I can girly it up as much as I want. I live with boys (except our female cats, but they don’t worry much about decor), so I’m always mindful when choosing the colours we decorate with… however this new space is entirely mine. I’ve been noticing that I’m gravitating to a lot of pink items… in fact, even though our logo is turquoise, my office will be black, white and pink. I found myself dipping my toe in the shame pool… lots of judgments from my teens and 20’s. (Shame helps no one, sweet peeps!) Little voices inside screaming “But it’s so GIRLY” – like that’s a bad thing. Yup… there’s lots of pink. There’s lacy accessories and a high heel tape dispenser. Eff it. I’m enjoying the softness of the colour palette (which extends into my wardrobe and accessories too) and embracing the power of my femininity…. As an entrepreneur, I carry some traditionally masculine traits, I’m ambitious, and driven. I push until I get my own way (though I go about it nicely). I can be blunt and to the point, but only because I don’t have a lot of time to dilly dally. However… I also get to soften these traits with my traditionally feminine big heart, open communication, gentle touch. (Who even decides what is traditionally masculine or feminine anyways?!) I get to embody all of this, in my own unique expression of girly-ness and wear it with pride in my attire, in how I carry myself in the world, and yes, in my office. After all, the company is called Pampered Goddess – it doesn’t get much more feminine than that.